At an event in the capital’s Westin hotel, Grameenphone launched the co-branded Micromax Q354 and relaunched the Lava Iris 505. The partnership aims to make it easier for everyone to access the limitless potential of the internet by making affordable, quality smartphones that can replace feature phones. 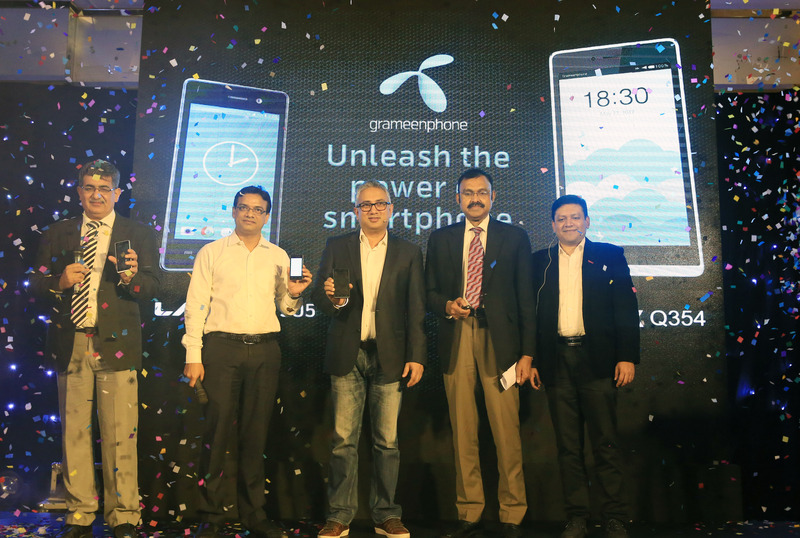 The smartphones were launched by the Chairman of BTRC Dr. Shahjahan Mahood in the presence of Yasir Azman, CMO, Grameenphone, Sameer Kakar, Vice President & Head – International Business, Micromax and Md. Zohorul Haque Biplob, Chief Operating Officer of Grameen Distribution Ltd.
Dr. Mahmood reinforced that empowering the Bangladeshi people with quality smartphones that are affordable is a step toward realizing the vision of Digital Bangladesh. The Micromax Q354 was designed specifically to be competitive in the Bangladeshi market. The device costs Tk/3,999 and has a 5 inch FWVGA display, quad core 1.3GHz MT6580 CPU, 1GB RAM, 8GB ROM (expandable via microSD up to 64GB), removable 2,200mAh battery, 5MP main camera, 2MP front facing camera, dual LED flash, Android 6.0 Marshmallow and dual SIM with 3G support. The phone is available in Midnight Blue and Silver colours and comes with a free screen protector and back cover. The Lava Iris 505 was originally launched in 2016 however Grameenphone and Lava were unable to meet the extremely high demand. They sold over 210,000 smartphones and have thus relaunched the Lava 505. The device costs Tk/- 2,945 and has a 4 inch WVGA screen, 1.3GHz dual core Mediatek CPU, 512MB RAM, 4GB ROM, 1,400mAh battery and 2MP front and rear cameras. The phones are covered with 1 year of manufacturer’s warranty but to make the deal sweeter, customers will get 15-day Early Life Failure coverage whereby if any device is identified as faulty within 15 days of purchase, the customer will get a new replacement smartphone. Grameenphone subscribers also get 1.5 GB internet free (with 7 days validity) and an attractive ”Buy 50 minute @ BDT 29 and get 1GB internet Free” offer with both the purchases provided that the device is first activated using a GP SIM. Customers can avail this offer 12 times in 6 months. The smartphones will be available at Grameenphone Centers, Grameenphone Express Shops , Grameenphone retail outlets all over Bangladesh, and online at GP Shop. Our unboxing and full review videos are coming soon.